ince it is resistant to automotive fluids, Victrex PEEK has been used by Chinese automotive parts maker Wuxi Shuangling Electrical-apparatus Factory to manufacture vanes applied in its rotary vane vacuum pump. It was used as an alternative to PPS and graphite. This vacuum pump is used in both diesel and turbocharged direct-injection gasoline engines by some of China's top automotive makers, including Great Wall Motors, Jiangling Motors, SAIC Motor, and Hawtai Motor. The vacuum pumps provide braking assistance by means of a brake booster and provide support for supercharging and exhaust gas recirculation. Vacuum pumps contribute to the overall safety and efficiency of the braking system by supplying brake boosters with negative pressure (0.9 bar), to reduce the amount of pedal effort required for braking. Therefore vacuum pump reliability, throughout a car's life time, is a critical design requirement. Any failure or deterioration in the performance of the vacuum pump would have an adverse effect on the braking performance of an automotive and may even lead to accidents. Therefore, automotive makers have established stringent requirements for the reliability and performance of vacuum pumps prior to assembly. Driven by pedestrian safety legislation, the pumps have had to be positioned closer to the oil sump, where they experience increased service temperatures, up from 100-110°C to 120°-130°C. 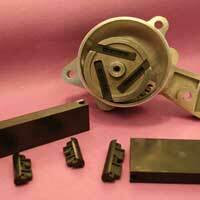 Wear resistance is becoming a more important factor for vane type pumps. Due to increasing speeds and temperatures, the load on materials has increased steadily, even for lubricated mechanical pumps. In recent years, the automotive industry has faced increasing pressure to maximise performance and safety while minimising fuel consumption, weight and cost. As a result, high durability, low cost, driving comfort and low environmental pollution have become the core measurements of R&D efforts. It is for all of the above reasons that the client selected PEEK since it is able to maintain high mechanical strength at 150°C for over 5.000 hours, and it resists becoming brittle when stressed by mechanical and frictional loads. It withstands the forces generated during cold starting (-40°C) where the engine oil has a relatively high viscosity. The excellent wear resistance results in a longer service life, says Victrex.